Marina One is a high-density, mixed-use building complex in the heart of Singapore’s new Marina Bay financial district which supports Singapore’s ambition to become a “City in a Garden”. Zeytouneh Square celebrates modern Beirut and uses the land’s existing topography to create an informal amphitheatre that is ideal for hosting events. 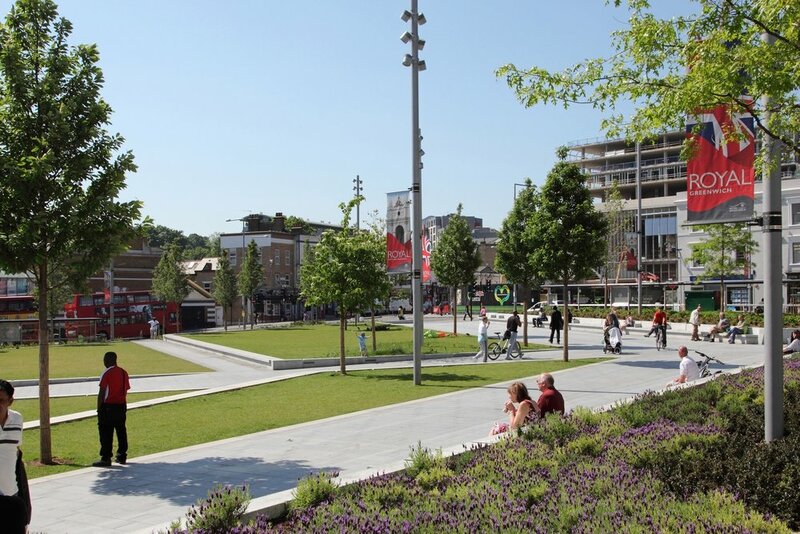 Developed with the local community, the landscape masterplan draws on the town’s rich architectural and military heritage to create two multi-functional, fully-accessible spaces. Our work at London Metropolitan University’s Holloway Campus seeks to unify a disparate collection of existing buildings and provide a new ‘heart’ at the centre of campus. Working as one of seven teams shortlisted from over 700 entries to redevelop one of the most notable buildings in Paris, our competition design improves the connection between the tower and the wider urban fabric reconciling the tower within the artistic Montparnasse district by encouraging new activities and events. Our design aims to recapture the active, cultural and multifunctional character in this area of Nottingham by providing a flexible space that can change character from day to night, and from season to season. Our design responds to a brief to create a vibrant space in the heart of Ipswich, which needs to remain flexible and adapt to planned and spontaneous events. Our proposals for St Peter’s Square in Manchester acknowledge the importance of the impressive historic civic buildings. Developed for a design competition in July 2008, our design for King’s Cross Square responds to a brief to accommodate the complex people movement and traffic and utilities infrastructure of the station behind and below.